Long ago, edema was known as dropsy or hydopsy. It is basically what happens when fluid starts to accumulate within the interstitium. Basically, it causes swelling. In medical terms, the interstitium is any of the body cavities or places beneath the skin. Normally, homeostasis within the human body determines how much fluid is present in the interstitium. When something disturbs the body’s homeostasis, then it can cause edema as fluid is retained. There are a number of different kinds of edema and even more potential causes. The grading of edema happens based on the duration and depth of the problem. Peripheral Pitting Edema: This is a fairly common kind of edema. Like the other types, it happens when there is water retention within the body. This typically happens during medical ailments like pregnancy, heart failure or similar conditions. Cutaneous Edema: This kind of edema tends to affect a small area. It is in a small area that suddenly starts to develop a lot of pressure. This leads to an indentation, and the indentation may remain even after the pressure has been taken away. Non-Pitting Edema: This is when there is an indention, but it is not a persistent one. It is typically linked to medical ailments like lopedema, myxedema and lymphedema. 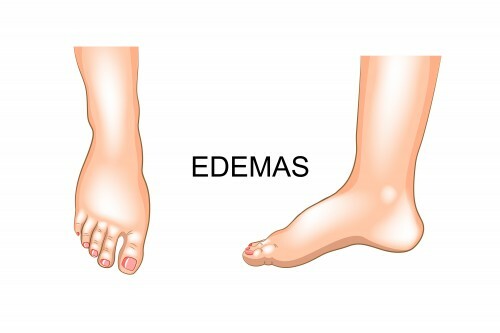 In patients with edema, the edema may account for about 10 to 30 percent of your body weight. In cases of severe kwashiorkor, the proportion of edema can even be as high as 50 percent. Pitting edema is typically rated on a grading scale of one to four. The scale depends on the depth of the pit and how long it remains. Grade 1+: This is when the pit is 2mm or less. You will see slight pitting that disappears rapidly. There is no visible distortion. Grade 2+: This is for a 2 to 4mm dent. It will be somewhat deeper than before, but it will not have a detectable distortion for the most part. Once you press on the edema-affected area, the pit will disappear within 10 to 25 seconds. Grade 3+ This produces a 4 to 6 mm pit. The pit may last for longer than a minute and is noticeably deep. The extremity that is on will be visibly full and swollen looking. Grade 4+: This is a 6-8 mm pit. It will last for two to five minutes and the extremity will be grossly distorted. This grades bilateral pitting edema. When not present, it is graded as absent. Grade 1+: Mild and in both ankles or feet. Grade 2+: Moderate edema that affects the lower arms, feet, hands and lower legs. Grade 3+: Generalized edema that severely affects both arms, feet, legs and face. Grade 1+: A barely detectable 2mm depression when you detect it that has an immediate rebound. Grade 2+: This produces a 4mm deep pit that takes several seconds to rebound. Grade 3+: This causes a 6mm pit that takes 10 to 12 seconds to start rebounding. Grade 4+: This causes a very deep, 8mm pit. It takes longer than 20 seconds to rebound.